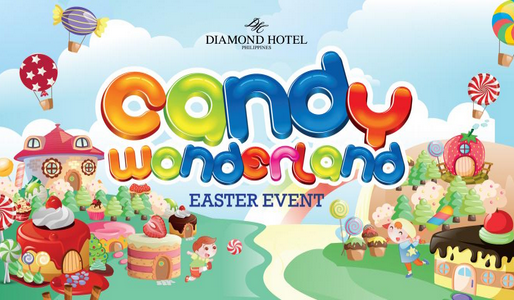 Your child’s Easter adventure just got sweeter at Diamond Hotel Philippines. It’s a Candy Wonderland Easter Event on March 27, 2016 at the Diamond Ballroom from 10am to 2pm. Delight in a sugarland playground that has been created for your kid’s Easterific escapade. Find your kid’s candy play land daydream come true heightened by exciting activities which includes: face and egg painting, cupcake decorating, photo booth, glimmer tattoo, kids’ salon and a musical show. Have your photo taken with Candy Wonderland characters, stilt walkers, mimers and our confectionery expert -- Executive Pastry Chef Sebastian Suarez! Kids and adults alike can indulge and enjoy an assortment of sweets from rainbow colored gummy bears, candy rocks, jelly beans, heavenly chocolates, fluffy cotton candy, and mini cupcakes that will be available for sale along with other delightful food offers from the hotel. Bring the whole family, be amazed and explore all the treats enchantingly prepared for you. Children in candy wonderland inspired costumes get a chance to win amazing prizes from the hotel and sponsors. Furthermore, kids get a chance to win the latest iPad Pro in the grand raffle. Ticket price is at Php1,000 nett per person inclusive of a take home snack box. Diamond Indulgence Carholders will get Php 100 off on the price, maximum of 4 tickets only for purchase. For inquiries call 528-3000 ext. 8461. And since it’s the season to relax and regroup, take a Holy Week vacation with the family without leaving the city. Available from March 19 to 27, 2016 for only Php 5,000 nett, relax in a Deluxe Room for an overnight stay that includes buffet breakfast for 2 at Corniche, use of the swimming pool, use of the Health Club and Spa, 20% discount on massage, and one (1) FREE one ticket (per room, per stay) to the Candy Wonderland Easter event. Book another room or stay another night and get the room at Php4,800 nett per night! Room only offer (excludes breakfast) is also available at Php4,300 nett per night. The room packages are applicable to local residents only. Prior reservation is encouraged. Offers may not be availed in conjunction with any other promotions or discounts. For room reservations please call 528-3000 ext. 1141 and use the promo code 6302015. Diamond Hotel Philippines is located at Roxas Boulevard corner Dr. J. Quintos Street, Manila. For inquiries, please call (632) 528-3000 or email bizcenter@diamondhotel.com. For more information on Diamond Hotel Philippines, please visit www.diamondhotel.com. For hotel updates and special offerings, follow us on Facebook at facebook.com/DiamondHotelPhilippines and Twitter, Instagram and Youtube at @DiamondHotelPh.